Weight Training For Speed: Do It Right! Want to get faster? Try weight training for speed! Speed and strength training go hand in hand. And when you use weights, you can really target your weak points. "Speed is directly related to physical strength. A stronger muscle can more easily overcome resistance to movement, whether the resistance is gravity, tight clothing, or a powerful push from an opponent." …or the weight of your own limbs (my addition) - which is what you are fighting when you want to move faster. If you are stronger, you'll be able to move faster. 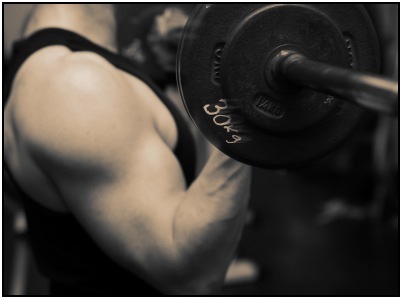 Second, weight training for speed allows your muscles to contract more powerfully. If you're relaxed and ready you can move fast, like punching your hand forward to tap someone on the chest. But delivering that punch with force is much more difficult. So, by practicing weight lifting for speed you can work to increase both the speed of your movement and the force of your movement. Which makes for a more powerful punch - or jump, or kick, or whatever. In addition, as you increase the energy of your punch and your ability to deliver that punch faster, your punch becomes more powerful. This is the reason that a hand placed on your chest forcefully pushing you backward feels not as bad as that same force delivered in a fraction of a second - in a punch, for example. Third, weight training for speed will give you increased muscle awareness. Which may not sound that important, but if you're really concerned with functioning at your best, then being really aware of your own muscle contractions, of which muscles are doing what, and of how those movements feel inside your body, is extremely helpful. Person 1 will be able to move faster since they have more muscle and aren't weighted down by extra weight (fat). That makes them much faster. Finally, work on your extension speed as well as on your retraction speed, and on speeding up your repetitive motions. Only when you've got all three will you be 'fast'. Being able to punch your hand out there quickly is great, but retracting it quickly is great too. You won't get your fist caught by an opponent, and it'll minimize the time that your fist is in contact with its target, making your punches more powerful. It will also minimize the time that your face is open to the opponent’s blows. And one fast punch isn't anywhere near as helpful as a whole flurry of them. Olympic style lifts, or powerlifting lifts, are great for weight training for speed. You might have to use less weight on the clean and press (or clean and jerk, or just a clean) than with your usual lifts, but it'll pay off. Choose a heavy weight and just lift it a few times quickly. This will build the sort of powerful, full body explosive movement that you want to be building. And really only do a few repetitions per set for heavy weight movements. This simulates the kind of exertion you have in many sports, especially martial arts. You'll need to do one hip throw, a heavy movement, with lots of explosive speed and power. Of course, you'll also have to develop your endurance so that you can pull off that one explosive movement during a match. But that's a separate thing entirely. If you want to practice a martial arts technique, keep the sets small. Sprinters don't train by running marathons - they do lots of sprints, with lots of resting in between. So, do just that. If you want faster punches, do punches whole holding light dumbbells until you just start slowing down. Then take a rest, and do another set in a few minutes. Remember, you're training your muscles to contract in a certain way (very quickly, in a punching motion in this case) rather than training until you wear yourself out. And your quick and powerful fast twitch muscle fibers will fatigue quickly, so give them enough time to recover. Here's a trick for when you're doing weight training for speed: do the movement you want faster with weight, and then do it without weight. When you lose the weight, for the next 10 - 20 repetitions you'll feel really light before you adjust back to your regular body weight. And for the time that you feel light, go fast! You're taking advantage of that weight reduction to train the skill of moving your body faster. This doesn't fatigue you as much as some of the other techniques. It really lets you work on the skill that is speed. I especially like this technique. I use it all the time when I practice swordsmanship: I use a really heavy wooden sword first and then a thin, very light wooden sword to do speed training. Plyometrics are specific exercises designed to get your muscles to contract faster. Some use just your body weight, while others use weight training for speed. Getting into the details of plyometrics is way beyond the scope of this article. But if you're really into speed and strength training, look into them. • Click here to leave 'Weight Training For Speed: Do It Right!' & go back to the Home-page! 1. Christensen, Loren W. 1996. Speed Training: How to Develop Your Maximum Speed for Martial Arts. Boulder, Colo: Paladin Press. Pp. 39.